I ordered 3 of these for my living room and they look amazing! Very sturdy and easy to put together. A little bigger than I was expecting but it ended up working out better that way. I love the shelf at the bottom. You can put a basket for books or whatever down there. Would recommend this end table! Add an industrial touch to your living room or family room with the Bryson end table from iNSPIRE Q® Classic. Featuring an X design frame, a dark metal finish and a rustic wood grain finish, this end table will complement any transitional, modern, or contemporary decor. With a lower shelf, you'll have space for books, decorative items and more. Available in oak, brown or grey wood finishes. 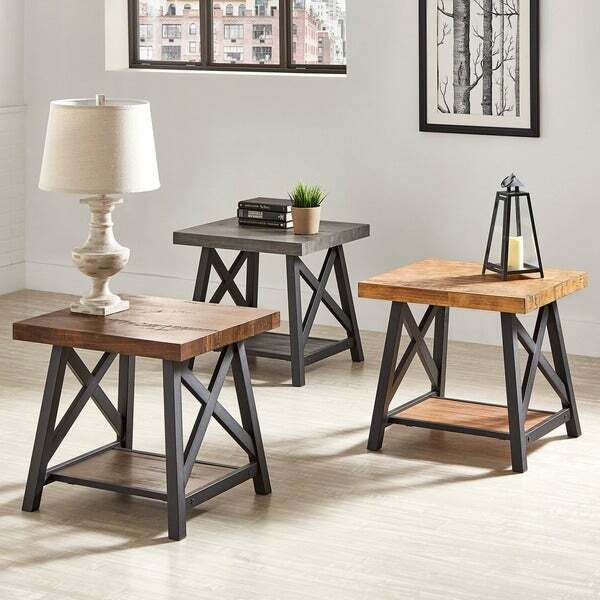 These Bryson Rustic-X Base End Tables with the lower shelf are very solid and sturdy. They were easy to unpack and assemble; the first one took about 15 minutes and the second less than ten. I am happy with the color as they match other items I purchased through Overstock and the color posted on the site is accurate. The top shelf is perfect for lamps or displaying framed pictures and the lower shelf is a great space for storing useful items like candles or insense burners, but also keeping them out of the way when not in use. Sturdy, easy to put together (wait till the end to tighten the fasteners, then go over them once more to be sure all are secure.) Looks great with the Emeril coffee/cocktail table that we also purchased from Overstock, seems very sturdy. I loved this piece so much I turned around and bought the coffee table. The wood looks very rustic and the metal pieces are heavy duty. Perfect rustic piece for my living room. Love. love, love this table! It's sturdy and beautiful. It adds so much style to my decor and finishes the area off between my chairs. My boyfriend and I bought this end table to match our coffee table and TV stand. The set looks great together, and it goes with our farmhouse styled home. The end table is very sturdy and well made. This end table arrived quickly. It was packaged very well. Looks just like the the picture, love it. I'm very pleased with this purchase. Perfect Tables for our Beach House - Love them. These tables went together very easily and look just like the picture. We like them a lot. They look great! Excellent value! This item is very easy to put together and sturdy. looks great. This is really a good table for the price. Easy to put together. My husband and I did it in about 10 minutes. Perfect size, height, everything. We use them as night stands! Good quality and look nice!! We bought the side table to match our coffee table. Great/ sturdy piece but a little bigger than we would have liked for a side table in our space. Great furniture. Durable and beautiful. This table was larger than I expected. It looks very sturdy and we love the color. Love these tables. Got so many compliments on them. Very easy to assemble and they are very sturdy and well made. Would highly recommend for living room as well as bedroom. I absolutely love these tables, they are strong, and sturdy, and easy to assemble! "I saw where the dark brown end tables were out of stock. Are these guaranteed to be in stock in January 2019? If so, I will order the sofa table now and get those in January. Can I pre-order the end table?" This item in the brown color is estimated to be back in stock in March 2019. "When will the Brown version be back in stock?" This item in the brown color is estimated to be back in stock in January 2019. "with the grey it says black/wood/grey finish...its confusing ...its grey with a black bottom...correct?" Yes, that option is the grey wood finish with black metal option. close enough to what I was looking for! Compliments the rustic theme of our living room. Looks beautiful and well made. Hope I'm not disappointed!! "Are the legs the same color for every finish option?" Yes, the metal frame is black for all the options. "How much weight can the table safely hold?" This item has not been weight tested. to view assembly instructions for this item.